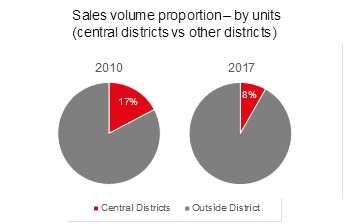 Although JLL primarily focuses on commercial real estate, we do track the local residential real estate (new project sales) market because it is an important driver of the local economy. In this article, we take a look back at the trends over the past five years and summarize what has happened and then attempt to make some educated guesses about where the market will go next. Between 2013 and 2018, monthly sales volume (shown by the shaded area in the accompanying chart) has ranged widely from 4,000 units to around 30,000 units. Prices over the same period (illustrated by the dark bar) have risen from around RMB 9,000 per sqm on average to over RMB 16,000 per sqm. Over the past year, there have been price swings of RMB 2,000 per sqm within just a few months. The peak showed in March 2017, at about RMB 17,400 per sqm. Readers may initially be surprised as these numbers sound low, but bear in mind that they are an average of all areas in Tianjin. Prices in central districts are much higher than this overall Tianjin average. However, since only 8% of all new sales in 2017 were in Tianjin’s six central districts, the average prices mostly reflect price levels in suburban districts. 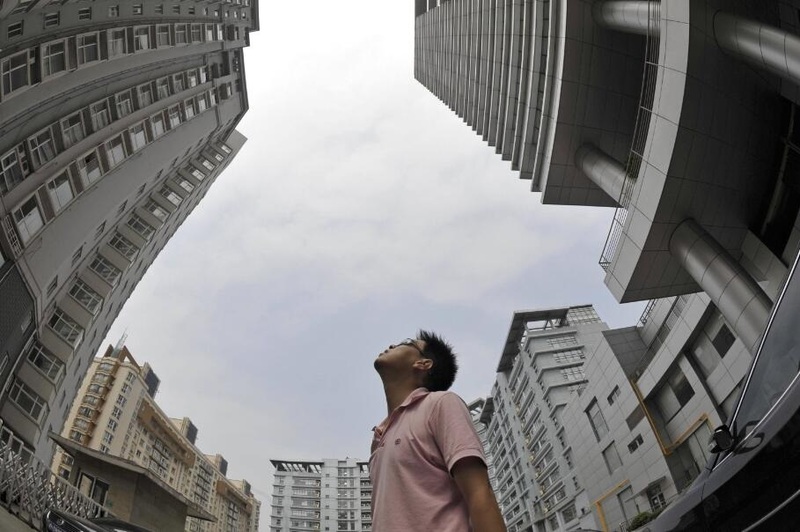 Like many other Chinese cities, Tianjin’s residential market is largely policy driven. We found that almost all significant changes in price or volume over the last five years corresponded with new housing measures or related residential policies. There are the four main policy drivers influencing the residential market and causing volatility in the market. • A hukou or local household registration is a valuable asset, especially for people hailing from less developed provinces. In 1994 Tianjin created the “Blue print hukou policy” allowing people to purchase houses above a certain price (RMB 800,000 in central districts) and paying in full, to acquire a Tianjin hukou thus granting them access to local social benefits, including education and health insurance. During the past 20 years, more than 300,000 people have got the Tianjin blue print hukou. After May 2014, the government cancelled the blue print hukou policy and issued a new hukou regulation based on a points system. 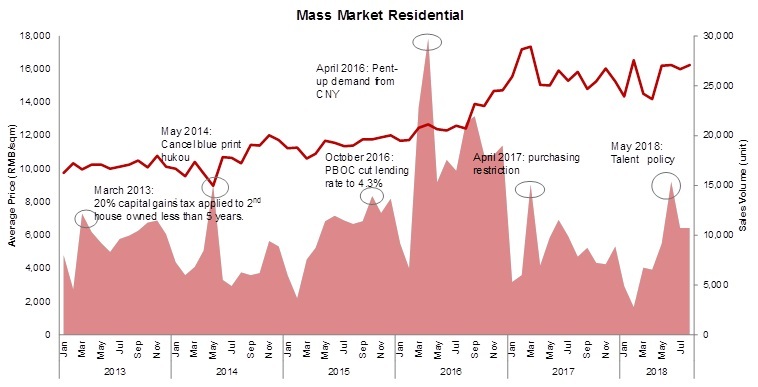 A month before May 2014, housing transactions were pushed up dramatically (about 15,000 units) by non-local people, as they saw it as the last chance to get Tianjin hukou. • In May 2018, a new talent policy was rolled out by the local government. The new policy aimed to attract talented and skilled experts to work in Tianjin, and then support the residential market in the long term. Another small sales volume peak showed in May 2018. • When the market is weak, the government eases purchasing restrictions and lowers payments. For example, in late 2014, buyers of second homes were allowed to pay only 30% down payment if they have paid off their first home loan (previously 60%). In May 2015, the local government lowered the down payment ratio for all first time home buyers using the housing fund to 20% (previously 30%), and loan limit increased to RMB 600,000 (vs RMB 400,000). • When the residential market is overheated, tightening policies are rolled out. For instance, the latest cycle of tightening regulations started from September 2016, when housing prices reached an annual growth of over 20%. Tianjin local government restricted non-local and local singles from buying a second house and restricted local families from buying a third house. The new measure also raised local families’ down payment ratio for their second home to 60%. • The Tianjin government sets land price caps to help regulate housing prices. 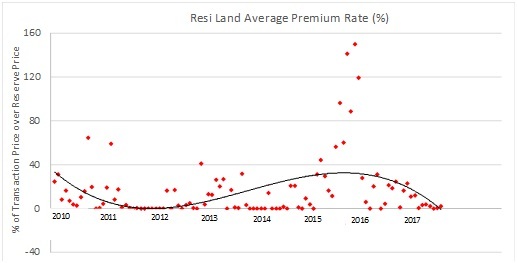 After the land price premium peak in 2016 (shown in the chart), land price growth slowed down and average premium rate fell to 3.9% YTD. It generally takes changes in land prices about two years to filter through to housing prices. 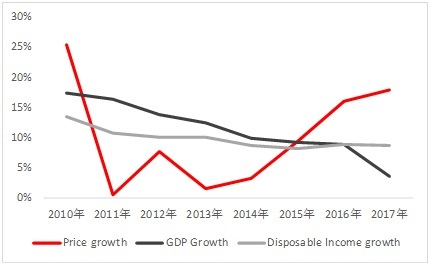 • Tianjin GDP grew at a double-digit rate until 2014. However, in 2017, the annual GDP growth slowed to 3.6%. Along with economics slowing down, Tianjin experienced a population outflow. The permanent resident population fell by more than 50,000 in 2017, which was not good for the long-term housing demand. In addition to the four main drivers mentioned above, better education and medical resources provided in Tianjin continue to attract demand from both local and non-local residents into housing market. Education is a prime example, especially as Tianjin is home to two top universities, Tianjin University and Nankai University. Tianjin hukou holders get preferential treatment when applying for local universities and universities across the country, resulting in 75% of local applicants gaining admission to key universities in China in 2018. Considering this, there is no surprise that when the “Tianjin Talent Attraction Plan” was released in May 2018, about 300,000 people applied for Tianjin hukou in a single day. However, Tianjin is not the only city which is focused on attracting talent to boost its economy. Other tier II cities, such as Xi’an and Wuhan also released talent policies and provided hukous for specialists and experts. Over the past five years, residential prices have risen overall, but there have been some rapid adjustments both up and down, while the volume of sales has experienced very dramatic swings. The government has actively participated in the market using levers such as purchasing restrictions, talent attraction plans and land prices to try and moderate these forces. We forecast that average housing prices will keep growing over the long term, but at a much slower pace as compared to the last five years. Sales volumes will also likely remain relatively stable. As local and national economic growth has slowed and the local population declined slightly, demand for investment will likely be muted. To stabilize the housing market and avoid speculation demand across China, the central government is looking to implement a property tax for second house buyers. All of these factors mean we are still optimistic on the Tianjin residential market long term, but believe that it will be a more stable market going forward.